Our trips to Argentina are mellow and relaxing. We don’t cover a lot of ground, but the places we visit are very dense with wildlife and beauty. This trip focuses on birds and marine life. Argentina is a wonderful country to visit. Covering nearly 2,200 miles from north to south, Argentina can offer a lot to a traveler. 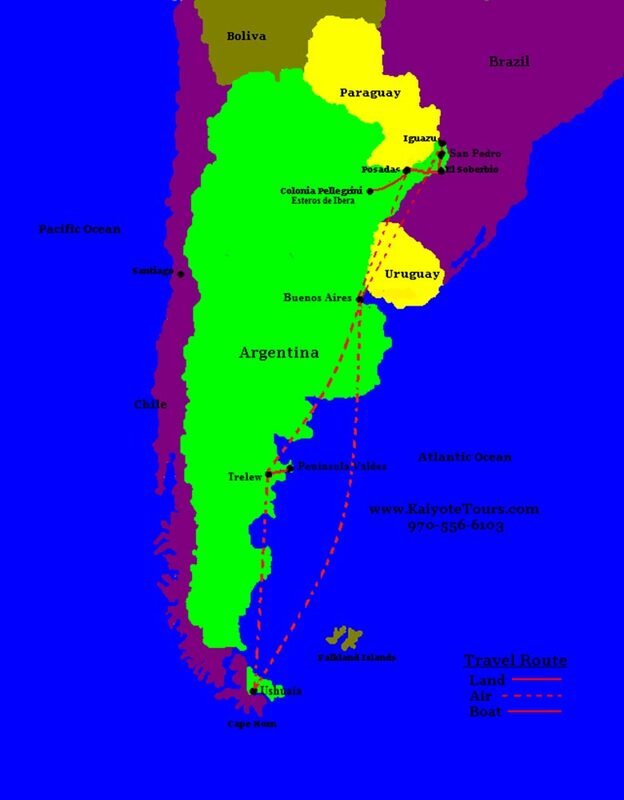 This trip starts with two nights in Buenos Aires before we heading south to the Peninsula Valdés and Ushuaia at Tierra del Fuego. Highlights: 1) Penguin watching of the coast of Ushuaia. 2) Seeing the stars of the southern hemisphere 3) Watching birds and sailing the Beagle Channel. 4) Attending a tango show in Buenos Aires. Rates include: Domestic transfers, lodging, breakfast, lunch, dinner, scheduled group tours, entrance fees & Allianz travel medical insurance. Visas needed for this trip: Argentina (free) obtain at airport. Most flights from the United States are over-nights flights. We will meet you at the Buenos Aires Ezeiza International Airport (EZE) with a shuttle to the hotel in downtown Buenos Aires. Activities for the day will depend on the time of your arrival. We will be staying close to the Reserva Ecológica Costanera Sur, which is a large nature reserve for birding and walking along the waterfront. Over 200 different species of birds have been seen on this beautiful marshland and park. We will have a walking tour of the historic harbor and plazas. The hotel has a roof top swimming pool for viewing birds and city views. It is a 2-hour flight from Buenos Aires to the town of Trelew. From Trelew it is a 1.5 hour shuttle ride to Puerto Pirámides. The long travel day will be well worth it when you see the shores of the peninsula. We will be staying three nights at an Ecolodge in the heart of nature and wilderness. We will have two full days of birding, hiking and exploring. There will be day trips to various areas of the peninsula. Another day of experiencing this beautiful natural area. It is a 2.5 hour flight further down the continent to the edge of the world and to a small town named Ushuaia, which is located at the edge of Tierra del Fuego. We will have 2-days to bird and hike in Tierra del Fuego National Park. There is also great birding and walking along the Ushuaia harbor. Besides birding and hiking, there is a lot to do in Ushuaia. On our first full day here, we will be taking a sailing trip in the Beagle channel. There is wonderful bird and marine life to see in this area and the snow-capped mountains that surround the area are especially beautiful. Ushuaia is mainly a tourist town and so there is great shopping here. There is also an historic prison and maritime museum that are very interesting. Birding and hiking are the main activities for the day. Flights back to Buenos Aires take about 4 hours and we will be staying in the city close to the Reserva Ecológica Costanera Sur, which is a large nature reserve for birding and walking along the waterfront with nice beaches. The hotel has a roof top swimming pool with great views of the reserve and waterfront along Puerto Madero. In the evening we will have dinner and see a tango show. Shuttle to the airport for your trip home. Depending on when your flight departs, there will be free time for your last day in Buenos Aires.